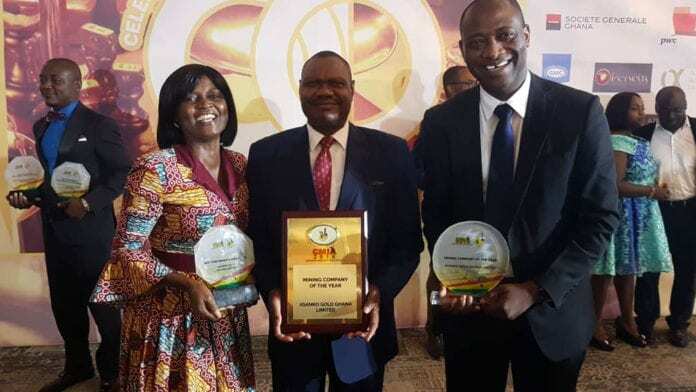 Asanko Gold Ghana has expressed its delight to have won the prestigious “Mining Company of the Year” and the “Best Performer in Innovation” Awards from the Ghana Chamber of Mines at the annual Ghana Mining Industry Awards Ceremony last Friday. Congratulating the team, Peter Breese, President & CEO of Asanko Gold Inc, said “We are thrilled that Asanko Gold Ghana has won the highest accolade possible from the Ghana Chamber of Mines and been recognised as “the Mining Company of the Year” amidst stiff competition. Frederick Attakumah, SVP for Corporate Affairs & Sustainability, added “Over the past three years, the whole team, including our service providers, have worked hard to establish the Asanko Gold Mine as a world class operator within the Ghanaian mining sector with a strong focus on health and safety, environmental stewardship and community development through jobs, social investment programmes and local procurement. It is immensely gratifying for this to be acknowledged by our peer group with the “Mining Company of the Year” and the “Best Performer in Innovation” awards.